Brazen racing held their ” new race” on the 17th of March. The MHRC had a great turnout for this race. 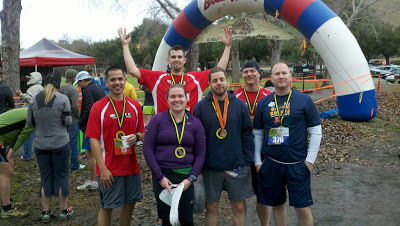 It was a rough and muddy course, but everyone completed it and we had 2 Age Group Top 3 finishers! Big congrats to Matt Mullen and Janice Hom for placing in their Age Divisions!! Two members of MHRC braved the heat out at Contra Loma to run the Drag N Fly Trail Run. This was a savage course with some insane hills. I think I may have been the only MHRC member that ran Bear Creek. But 2 of our members volunteered for it as well and they deserve some praise for that. Greg Holtz & Matt Mullen volunteered. Â Greg even had to run all the way to start to get medical help for a distressed runner. Big ups to both of the them.